Halloween in Los Angeles is more than a month-long affair, and we’ve lined up the best Los Angeles Halloween events for you. 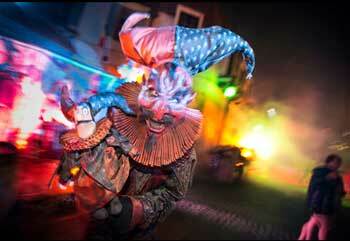 Let your inner ghoul shine at masquerade balls, costume carnivals and more! Oct. 31. The Corner Door, Waterloo & City, and A-Frame are celebrating the spirit of Halloween with “Boos for Booze” – a cocktail crawl in Culver City. The trio of restaurants along Washington Blvd will offer spooky snack and cocktail specials (from the likes of The Corner Door’s Beau du Bois) at rotating times for imbibers in costumes. The crawl kicks off at A-Frame from 5-7 p.m., moves onto Waterloo & City from 7-9 p.m. and culminating at the Corner door at 9 p.m.
Oct. 31. AV Nightclub and Aventine offer a Halloween party that features five celebrity DJ’s, with special guests to be announced. Come dressed to impress because the person in the winning costume receives a $1000 prize. $100 open bar 10 p.m.-2 a.m. For table service: rsvp@avhospitality.com. 1601 Cahuenga Blvd., L.A., 310.334.9619.